The newest generation of Colombian filmmakers is no longer interested in shocking its audience with the horrors taking place in their country. Tired of blood and violence they instead focus on depicting what happens outside of the frame. Without the use of much dialogue they take us along capitals, villages and the impassible jungle. We experience the country and its politics from the perspectives of confused paramilitaries, fleeing women or lost adolescents. 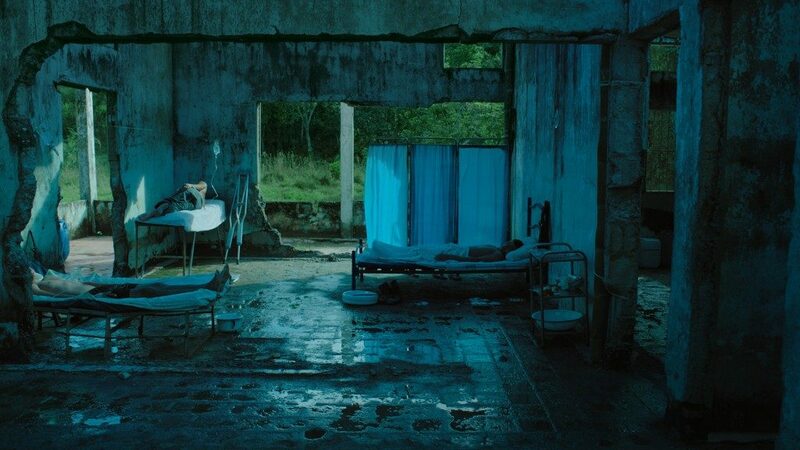 Felipe Guerrero feature debut Oscuro Animal has some striking similarities with Jorge Forero’s film Violencia another impressive Colombian feature debut I watched in Berlin last year. It made me even more curious to talk to him about his film, which was in the Tiger Competition of IFFR this year and has party been supported by Hubert Bals Fund. Oscuro Animal tells the story of three women, forced to flee their homes in a war-torn region of Colombia. Each journey, marked by terror, takes her on a trek from the depths of the jungle to the outskirts of Bogotá, where each must gather the strength needed to start a new life. I meet Felipe in the Doelen where we talk about his film and his nowadays life. Although he lives outside of Colombia, he is still deeply involved with his country. RMA: First of all: how did you get in filmmaking? FG: Oscuro Animal is my first feature film. I come from experimental documentary, like essay films. Both of my films [Paraiso (2006), Corta (2012)] were shown at IFFR. I went to Centro Sperimentale di Cinematografia, the national film school of Rome, where I studied editing. I’ve been working as an editor for years. RMA: Did you leave Colombia to study in Rome? FG: Yes, 20 years ago now. I spend 10 years in Italy and now I’ve been living in Argentina for 10 years. RMA: I’m counting, because it means you are actually much older than you look! RMA: Why did you make this film? FG: I wrote the script fourteen years ago. I won a residence in Madrid where I made the first version but I never did anything with it until six years ago. RMA: How come you let go of the script for so long? FG: I don’t know…. I just started working on one of the essays and I was so busy. And after that film I made a more of less similar, experimental documentary. But then I suddenly really felt the urge to make a fiction film. RMA: What was it like to reread a script you had been working on 15 years before? FG: Yeah, I was impressed! [Laughing] It needed a re-write, but it was good. FG: I know the film; the producers are friends of mine. I was really surprised when it came out, but actually I thought it was great. RMA: For me it made watching your film more special. I had seen a similar story with men; you gave ma a feminine perspective. FG: When I started to do my film, I had some difficulties on how Colombian cinema represents violence. Generally it’s depicted superficial and extremely realistic. For me that is a problem. Ok, the superficial part is personal; it is the other directors point of view. But when you transform reality into images, I believe you can be more symbolic and abstract. You don’t always have to represent ‘the real’. It is the same everywhere. I prefer to make something more abstract and surpass the rules. The costumes of the military are for example a new representation of that reality. RMA: Maybe people don’t experience violence as literally as it is often portrayed in cinema? FG: Yes. And I worked on the film knowing that the audience already knows too much about the war. There is nothing more to say about it, they know everything about extreme violence. Therefore I prefer to work with reverberation. We only see what happens ‘outside of the frame’. RMA: So you don’t want to be the kind of director that ‘shocks’ it’s audience? FG: No, I prefer to work with tension. But the tension is in the sound and landscapes. “When you transform reality into images, I believe you can be more symbolic and abstract. You don’t always have to represent ‘the real’.”</h2? RMA: Why did you decide to work with only female perspectives? FG: When 15 years ago I was toying with the idea of making this film the conflict in Colombia was extremely bloody. I read many human rights reports and met some victims of which the majority were women. Women are so fragile, but at the same time so strong. I believe they are somehow better in overcoming war than men because of their powerful resistance against it. FG: [Hahaha] Maybe… O I heard too many stories. The reality is absolutely terrible. FG: Yes, it’s really terrible. But I believe I am from a new generation of Colombian filmmakers that tries to work with the war and violence on a different level. Same as Jorge Forero. RMA: So the next feature film is also going to be set in Colombia? FG: First of all, my next film is going to be very simple. Oscuro Animal was so demanding. I would like to do a light, simple production. RMA: Set in one house instead of the jungle? FG: [hahaha] yeah, that’s going to be it. Currently I’m working on a small new project. It’s a correspondence documentary I’m working on with two other Colombian directors. We all have been living outside of the Colombia since many years but who make films on our home country. We have been exchanging video letters for the past two years. RMA: Sounds great. How did that happen? FG: We share a similar history. All three of us left Colombia almost 20 years ago. We have started a live in a new country, we have married women that are not from Colombia, we have become fathers of half Colombian sons and we all made three films. We enjoy seeing each other a lot so we became friends. We talk about cinema and about being separated from Colombia. In March we go to Cartagena film festival, in the Caribbean. All of our most recent films are selected so we will be there together. It is going to be the first time for us to be together the three of us. It is going to be great.